ZA-12 is a zinc aluminum alloy that’s known for its strength, hardness and stability. The ZA-12 alloy is commonly used in communications gear, computers, electronic devices, industrial machinery, scientific equipment and instruments/control devices. At Patriot Foundry & Castings, we specialize in quality sand casting services using a variety of materials, including the ZA12 alloy. Our cutting-edge nonferrous foundry is equipped to tackle jobs from one to thousands of parts, and ZA-12 castings weighing between 0.05 ounces and 232 pounds. Aside from metal alloy casting, we also offer many value-added services, including pattern design/production, heat treating, annealing, machining, powder coating, painting, anodizing and assembling for completely finished parts. We’re proud to be ISO 9001:2008 certified (Certificate No. : 11-2168). Our DUNS number is 826918117 and our CAGE Code is 54J41. 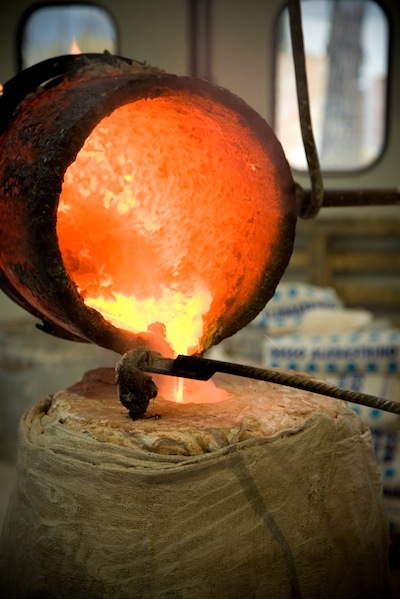 Learn More About Our ZA-12 Alloy Casting Services! For a free initial ZA-12 alloy castings consultation, send us a message or call us today at (603) 934-3919. We’re based in New Hampshire, but provide services throughout New England, Greater Boston,Massachusetts (MA), Vermont (VT), Rhode Island (RI), Connecticut (CT), Maine (ME), New York (NY), New Jersey (NJ), Pennsylvania (PA), Delaware (DE), Maryland (MD), Virginia (VA) and all of the U.S.